St Barts � Balmy Breezes and Beaches. St Barts is arid, with volcanic rock of just eight square miles, and is home to fabulous beaches, luxury yachts, designer duty-free boutiques, and celebrities. It’s natural beauty is like no other. 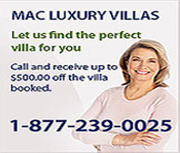 MAC Caribbean Villas (MAC) can help find your ideal villa. With over 25 villas on the island to chose from, MAC can help connect you with the villa that fits your personality, lifestyle, group size, and budget. These beautifully appointed villas all come with private pools, personal space, and a little piece of Heaven. Getting married? Need a corporate retreat? There are villas for that too! Look no further than MAC for your Caribbean vacation rentals.